The expeditionary force got out of two cars and ambled, with less than military precision, across the baking car park. This one was mixed: British and American. Young and forever young. Phil, Me, Andra, Michael, Cayleigh, Maddie, Felix. All with one common aim: to find air conditioning, fast. It needed Charleston belle Andra Watkins, with that famous combination of manners and straight talking to point out that I was looking through heavily tinted glass. We don’t have glass that tinted in England. We’d need torches if our glass was that dark. Works well on Sullivan’s Island, though. The military gentleman behind the desk welcomed us cordially. This space was the Fort Moultrie Museum, he said, and we could watch a 25 minute film about Fort Moultrie in the Fort’s purpose-built cinema (how Poe would have loved that) before making our way out to the Fort itself and gazing over that well-guarded approach to Charleston Harbour. I grinned, and assured him that I have the emotional hide of a rhino. At which he directed me wickedly to the exhibit about the English Commodore who got his pants shot off. Before we go any further, these are American pants, which to British readers means trousers. Or possibly britches. Hose. Not undergarments, though I have no historical evidence that the Commodore was, or was not actually wearing any of those. His name doesn’t help: he’s named for Spiderman, or Spiderman for him. Sir Peter Parker, 1721 – 1811, was born in Ireland and made it big in the Royal Navy. 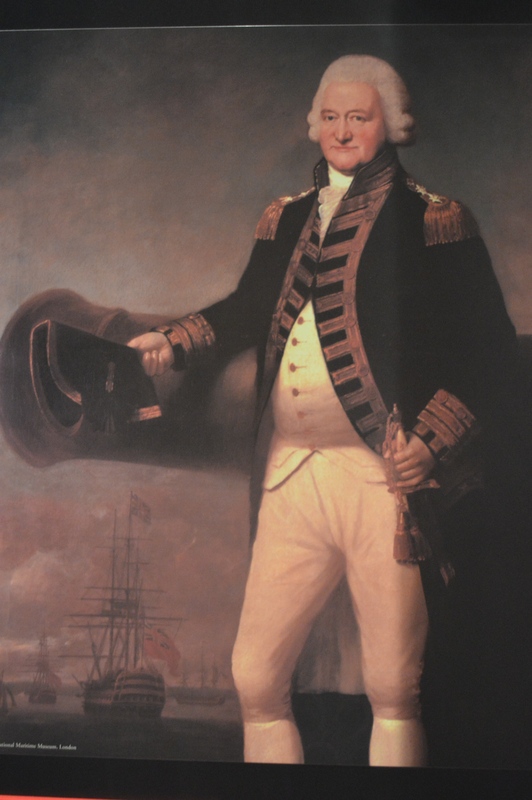 Parker’s career took an ignominious turn when he was sent with a force providing support for loyalists in the Southern Colonies: and Charleston promptly threw a tea party similar to Boston’s, urging all importers of British East Indian Tea to throw it in the harbour. Sir Peter’s job was to take up the gauntlet. The inhabitants of Charleston knew his ships were on their way, having set out from Cork. And they wasted no time in making a fort out of something so spongy and porous it would make light of bombardment from British ships by simply absorbing the impact: those famous, fleshy palmetto logs. Accounts of the battle are many and varied, and I am no military historian. But it is probably fair to say (correct me if I’m wrong, Charleston) that the British misjudged the topology of the rivers and their tides, and indeed the stubborn inscrutability of those palmetto logs. And the Americans fought back with the zeal of caffeine and the New World. Long and short of it is: Sir Parker, Commodore, knight and first baronet, managed to get hit by what the British to this day term ‘a flying splinter’ . American Military historian Maurice Matloff says his pants were set on fire. On one thing, however, everyone is agreed: the Americans blew his pants off, fair and square. The Museum attendant’s eyes twinkled remorselessly; but he wasn’t going to get a rise out of me. He had forgotten, as so many do, of our British love of farce, and bottoms without pants on are at the heart of farce. I found it every bit as amusing as he did. And just a tiny bit of me wishes I had been there to witness it. Posted in Quirks of History, The Charleston ChroniclesTagged battles, Charleston, Fort Moultrie, history, palmetto logs, pants, Sir Peter Parker, South CarolinaBookmark the permalink. Very funny and what a sight that must have been. If it isn’t, Laurence, it should be. It was a very nice museum, Nancy. Most cool and refreshing. Although Sir Peter Parker is an imposing-looking gentleman, his substantial belly looks as though it enjoyed good food and drink. I hope he had a spare pair of breeches in his foot locker. The other thing Mr. Museum Attendant didn’t know was how well you can tell such “pants on fire” story. Well done. 😀 Once again, Penny, the story told itself. These stories just seem to come my way…. On another matter entirely :), have you seen this, Kate? It was a great day, Debra: all elements of it conspired to crystallise happiness. I shall remember Charleston most fondly, thanks to Michael and Andra.